Celiac disease is a condition that affects 0.1–1% of the general population in most countries. It occurs when the immune system responds abnormally to a protein called gluten in the diet, which causes damage to the lining of the small intestine. Gluten is found in wheat, rye, barley and a multitude of prepared foods. When individuals with Celiac disease eat food that contains gluten, damage occurs to the small intestine and individuals have problems absorbing food and its nutrients. The symptoms of Celiac disease are diverse. They can range from no noticeable symptoms to severe diarrhea, malnutrition and weight loss. Due to this large spectrum of presentations Celiac disease is often under-diagnosed. Some of the common symptoms of Celiac disease include diarrhea, bloating, excessive gas, abdominal discomfort, weight loss, and signs and symptoms of vitamin and nutritional deficiencies. Due to the nature and chronicity of the malabsorption, some individuals will have osteoporosis or anemia due to low iron. 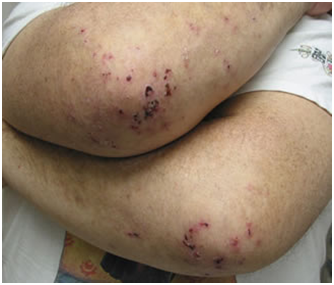 Some individuals can have a skin problem, dermatitis herpetiformis. It is an intensely itchy rash, usually located on elbows, knees, buttocks, lower back, face, neck and trunk, and occasionally in the mouth. When individuals avoid foods containing gluten, not only do their gastrointestinal symptoms improve but also this rash. In 90% of individuals with untreated Celiac disease, blood tests can be suggestive of this diagnosis. If the blood tests are positive, the diagnosis must be confirmed by performing a gastroscopy (also known as an endoscopy) and taking biopsies of the upper part of the small intestine. It is important that individuals ingest gluten for 3 weeks before they have testing for Celiac disease, whether biopsies or blood tests are performed or they may show a falsely negative result. As mentioned previously, some individuals can develop dermatitis herpetiformis. Certain rare gastrointestinal cancers and even lymphoma can also occur in individuals with Celiac disease. Avoiding gluten can usually prevent these complications. Once Celiac disease is diagnosed, the cornerstone of treatment is complete avoidance of gluten from the diet for life. This is very challenging, as gluten is found not only in the obvious sources of wheat, barley and rye, but is often used as a “filler” in prepared foods as well as some medications and other supplements. Although your physician can give you some general advice regarding this, individuals are usually referred to a dietician for guidance. The Canadian Celiac Association is a good resource www.celiac.ca With time, the individual with Celiac disease becomes the “real expert” as to which foods contain gluten. Is Gluten Avoidance Really Necessary? Individuals with mild Celiac disease who have few symptoms sometimes find it difficult to follow the gluten-free diet, or often “cheat” on the diet. It is difficult for someone with no symptoms to follow a strict and rigid diet for life; however, there are benefits to following the gluten-free diet, even in individuals with mild Celiac disease. Most will notice more energy and an improved sense of well-being. Some individuals, in spite of feeling well, slowly develop premature osteoporosis due to chronic low-grade malabsorption of calcium and other vitamins. Sometimes, these individuals will have the ‘bones of an 80 year old’ at a much younger age. A simple fall can cause significant bone fractures in these individuals. Untreated Celiac disease does put a person at risk of developing certain gastrointestinal cancers; this risk can be reduced by eating a gluten-free diet for life.